I recently reviewed the NZXT Phantom 820 and found it to be a remarkably excellent, intelligent case, so imagine my delight in learning that NZXT is following up that success with the Phantom 630. Over the past couple of years, NZXT has increasingly been carving out a niche as a case manufacturer that produces stylized, exceptionally feature-rich cases. As a former art student it's actually interesting to see that their products have an increasingly distinctive flavor to them. Some work is done by engineers. Some work has clearly been done by people with at least a little bit of a liberal arts education, people who are having fun with their jobs. However you feel about the styling (and I did tell them I wasn't fond of the side window and grate, which uses the same style as the Phantom 820), it's hard to argue with what NZXT has on offer here. The Phantom 630 features absolutely everything the Phantom 820 did: custom illumination with a rainbow of color options, a built-in SD card reader (why does almost nobody else include this standard? ), an internal 30-watt fan hub with built-in fan controller, USB 3.0 support, a switchable LED backlight for the rear port cluster and expansion slots, three removable drive cages that each feature one, two, or three drive sleds so you can include exactly the number of drive sleds you need, and support for multiple Kraken closed loop coolers. There are also toolless snaps, motherboard standoffs come pre-installed, there's a cabling channel in the motherboard tray, and the usual removable fan filters. I fully expect the Phantom 640 to include a "breakfast port," which produces absolutely fantastic omelettes with minimal preparation time. ...we will be getting the Phantom 630 in for review soon. 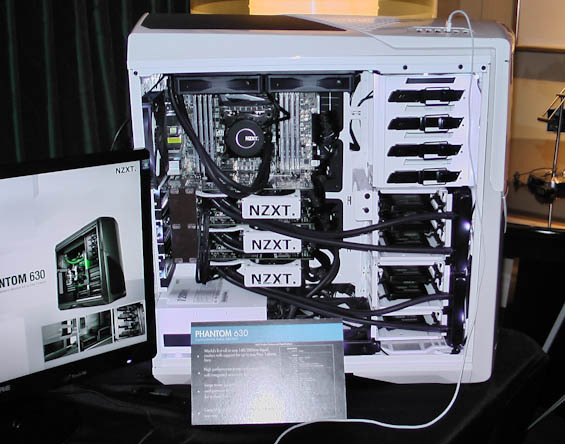 Less exciting but still impressive was the Hale90 power supply on display, which featured the usual modular cabling along with the kinds of stylistic touches (black accents on white) that I've come to expect from NZXT. Even the internal PCB is white. What the Hale90's interesting feature is an additional lead on the main ATX 24-pin power lead. This lead plugs into the Hale90 and informs the power supply exactly how much power is being drawn off of the main lead, and this is how the internal fan is controlled. Very cool. "Phantom 630 features absolutely everything the Phantom 820 did: custom illumination with a rainbow of color options"
Nice case, waiting for the review. I too find NZXT refreshing in their case design compared to the sea of look-alikes out there. "Some work is done by engineers. Some work has clearly been done by people with at least a little bit of a liberal arts education, people who are having fun with their jobs." Too bad you left the iBP party... they redrew your card and I won your Intel SSD :-p, so thanks!